With the ever present focus on water quality in the state of Vermont, now is a good time to know where you sit on a map. Watersheds are not always an intuitive concept, particularly in Vermont where things can drain in unpredictable ways. A watershed is an area of land where the brooks, streams, and rivers all drain into a common location such as a lake or larger river. 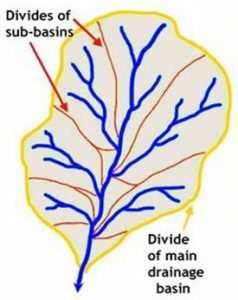 You can think of watersheds as a hierarchy. A drainage basin is the larger watershed unit for which all waters drain into a common large water body, such as Lake Champlain. Watersheds and sub-watersheds are a division of basins into smaller units. The entire lake is subdivided into sections for the management of water quality. One such segment is South Lake, which includes the McKenzie Brook watershed. 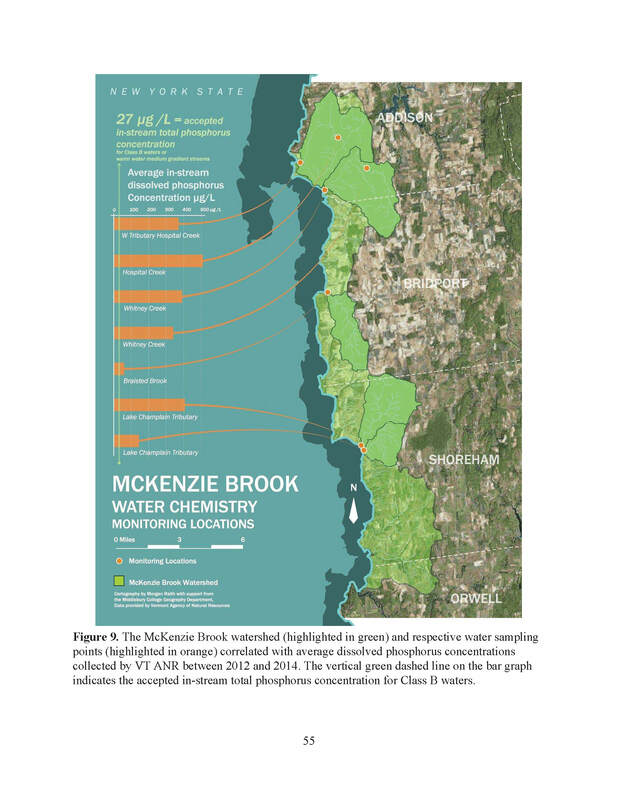 There have been efforts in the state to focus on these smaller watershed and sub-watershed units as a way to target efforts and resources in reducing phosphorus loading on Lake Champlain. Part of this effort is a funding focus on the part of NRCS. This approach is being piloted in an attempt to demonstrate whether more success can be gained from a geographic strategy. It should be noted that the “targets” are areas where additional money and time is being allotted, with the possibility that those “targets” will move as successes are reached. This is the first year of this approach. 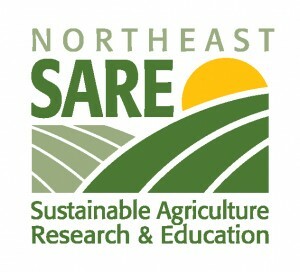 The Champlain Valley Crop, Soil and Pasture Team has been participating in this focused effort. The watershed currently targeted that falls within our farm community is McKenzie Brook. Other watersheds currently in NRCS focus are Pike River, Rock River, and St. Albans Bay. McKenzie Brook proper is actually in New York, but this is the name of the watershed that extends above Crown Point Bridge in the north (near DAR state park, Addison VT) to Route 73 in the south (just north of Mt. Independence state park, Orwell VT) and covers a narrow geographic region inland from the lake including Hospital Creek, Whitney Creek, Braisted Brook and the Lake Champlain Tributary. 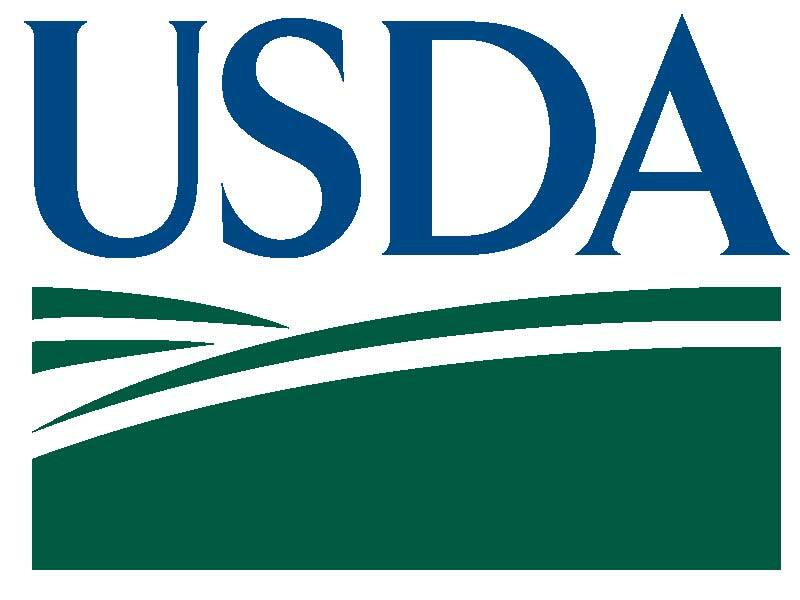 One of our grants that recently wrapped up was assessing the status of farmer’s nutrient management plans and helping farmers who needed new or updated plans get through the process. A second grant focused on the McKenzie Brook watershed is ongoing assisting farmers in signing up and following through with NRCS EQIP contracts to implement best management practices (BMPs). Thus far, NRCS has been able to obligate $800,000 of a $1 million dollar allocated potential for targeted conservation practices in McKenzie Brook watershed. We will continue to assist farmers in signing up and implementing practices. In addition, we are happy to help farmers try projects on small plots that may be outside the payment structure of NRCS. Collectively, we hope to quantify both NRCS and non NRCS funded practices in McKenzie Brook to demonstrate conservation success over time. We also have demonstration projects set up specifically in McKenzie Brook, and will continue to facilitate discussion over successes and agronomic realities of practices. Look for information about upcoming events on our events webpage. However, you don’t have to be in McKenzie Brook to try a new practice. We have a lot of work going on in and around Chittenden, Addison and Rutland Counties, and imagine that “targets” may eventually move to other areas within the South Lake region. This spring we also began engaging in a unique collaborative project with Middlebury College and the Department of Environmental Conservation that we will be continuing this fall/winter and hopefully into the future. 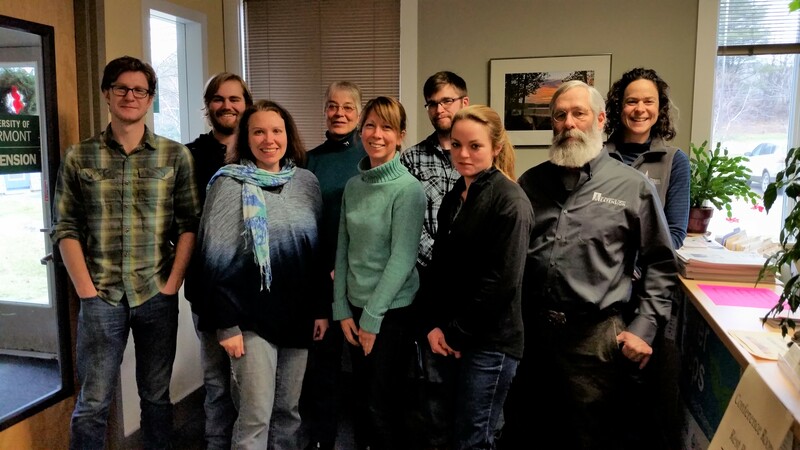 Middlebury College students in a capstone environmental studies class embarked upon a semester long group project of their choosing. This spring students mapped existing water quality data in McKenzie Brook watershed, attended some of our workshops and meetings to distribute a farmer survey about water quality and tile drainage, attempted some water quality sampling, and presented findings to farmers. This fall another group of students will continue this work on water quality and land use mapping, water sampling, and/or “ground-truthing” of water quality modeling. One important outcome of this work this spring was the visualization of data in a digestible format. The average concentration of phosphorus at five sample sites from 2012 to 2014 taken by the DEC is depicted in the map below (click to enlarge). McKenzie Brook watershed. Water sampling points correlated with average dissolved phosphorus concentrations. Data collection 2012-2014 by VT Agency of Natural Resources: cartography by Middlebury College ENVS students Emma Homans, Hilary Niles, Ben Harris and Morgan Raith. It should be noted that concentration and loading are two different things. We do not have flow data corresponding with this map (which may explain for example why concentrations in Upper Hospital Creek are greater than that of the West Tributary of Hospital Creek). We hope continued work will include flow monitoring to capture loading rates in addition to concentrations. Another take-away point that should be reiterated in all this discussion of the Lake is that turning off the “valve” of phosphorus from sources isn’t the same as removing the phosphorus in the Lake. It may take substantial time to see efforts realized in the Lake even if various sectors in VT come together to reduce phosphorus loading, particularly as other factors such as rainfall and temperature continue to impact algal blooms. Therefore, we are hoping to capture an increase in farming BMPs over time as we work together with farmers, and hope to see that correlate with reduced phosphorus loading in particular tributaries. We aim to demonstrate the utility of BMPs and that the farming community is actively engaged in this process. This is an ambitious goal, and success will require buy-in from farmers and dedication from parties involved. How do we have the “watershed moment” about watersheds? 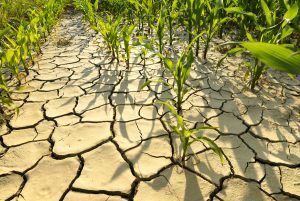 Hopefully, with continued engagement on this topic we can foster a collaborative community where farmers can learn from their neighbors and technical service providers can share information among farmers about how conservation practices are making for thriving agriculture and cleaner water in their own corner of the map. For questions about signing up you can also contact our office [802-388-4969]. 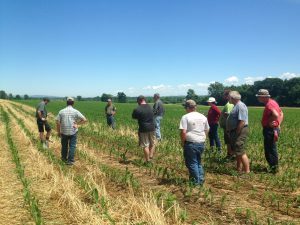 This year there were a number of farmers who no-tilled alfalfa in clay and silty soils throughout Addison County. 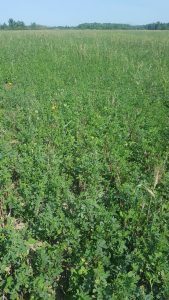 While this was a difficult year for good alfalfa establishment due to our dry, hot weather, all of the no-till alfalfa farmers had successful stands. All farms planted during a “window of opportunity”. While all farms managed their fields differently, there are generally 3 times through the year where there is a “window of opportunity” in which you can successfully plant alfalfa into your cover crop. These are: early April before green-up, mid-late May immediately after harvesting your cover crop for forage, or August after you combine and harvest grain and straw. One positive aspect about no-till seeding is that in the spring only the top inch of soil needs to be dry in order to plant, as opposed to the entire plow layer with conventional field prep. This means you can seed much earlier in the spring without the risk of turning your clay soil into moon rocks. All farms fertilized, prepared good/level seedbeds, and planted a cover crop last fall after short-season corn silage. Cover crop planting dates ranged from early September to the beginning of October. 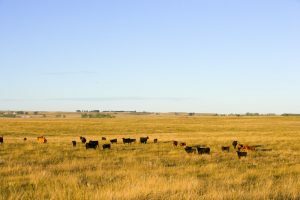 If you are planning on harvesting your winter rye/triticale/wheat as forage, the earlier you can plant in September, the better your spring yield will be. That means you will want to make sure you plant a corn silage variety that can be harvested early enough that you have adequate time to prepare a proper seedbed. If you do not want to harvest forage from the cover crop, either plant at a lighter rate or plant a mix that has a winter cereal with a winter-kill crop like oats or radishes. All farms planted at the proper seeding depth. For winter cereal grains, planting depth should be between 1-1 ½ inches, which means you need to plant with a grain drill. Broadcasting and lightly tilling it (followed by a roller) can work, but there is a very fine line between incorporating your seed and burying it. Broadcasting and only going over the field with rollers is not recommended. The seeding depth for alfalfa should be between ¼ to ½ an inch. Most farms used a grain drill, but it is possible to broadcast your seed if you “aggressively scratch” the field before seeding and pack it several times afterwards. 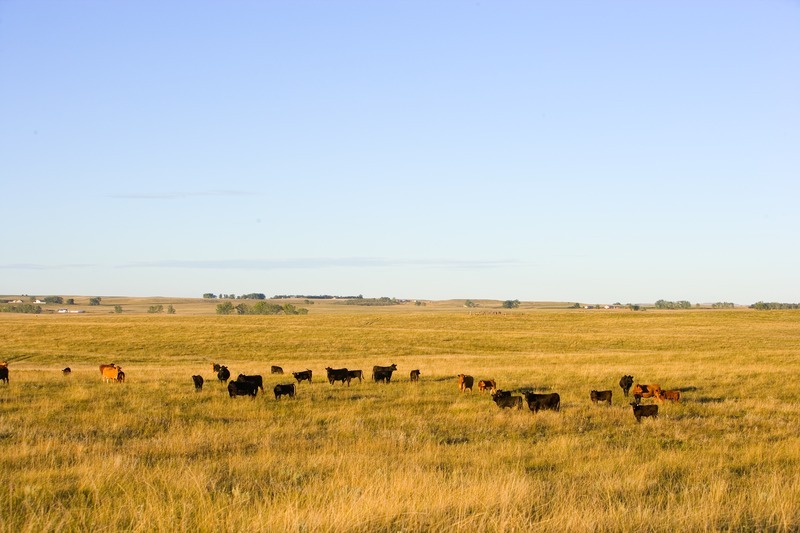 All farms planted alfalfa into a low-competition environment. 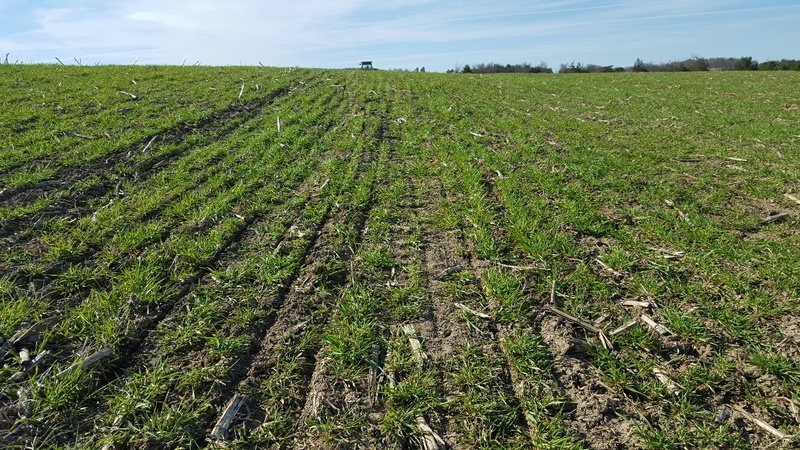 Some farms planted into their cover crops in mid-April before there was much spring growth, a farmer planted his alfalfa in May after harvesting the cover crop as forage, and a few farms planted alfalfa in April, spraying and killing their cover crop immediately afterwards. You can have good alfalfa establishment in a thick cover crop/nurse crop, but you will have less first-year alfalfa yield when compared to a light cover crop/nurse crop. Three farms successfully frost seeded 5lb/ac red clover in March into their cover crops. Frost seeding can be an effective way to introduce crops into fields. However, you need three things to happen perfectly: very small seeds, soil that will freeze-thaw, and bare ground. These cover crop fields seemed to be good candidates for frost seeding 5lb/ac red clover in March, and by August you could definitely see where we did and did not frost seed. Planting alfalfa and other hay crops is risky no matter the year. Hopefully more farms try this method of seeding so we can learn more about the best way to establish and maintain this valuable crop. In t he Champlain Valley of Vermont, Vergennes and Covington clay soils used for grass hay production are subject to soil compaction over time as equipment travels over the crop for multiple passes for maintenance and harvest operations. 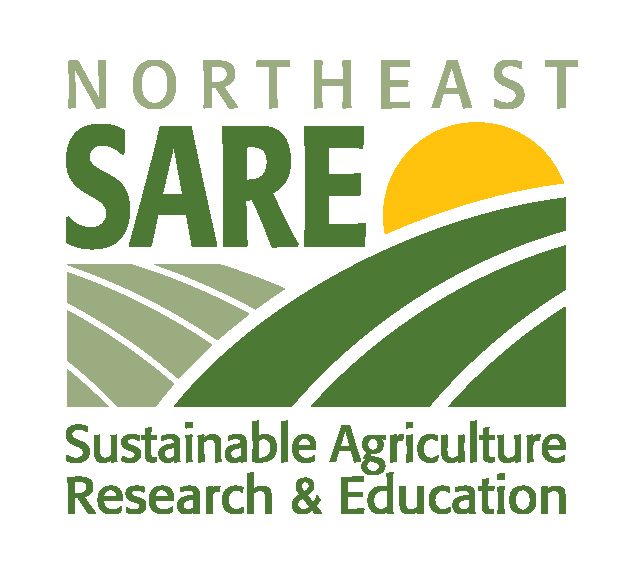 The Champlain Valley Crop, Soil, and Pasture Team received a Northeast SARE grant to investigate the potential benefits of regular and consistent aerator use on permanent hay fields to help alleviate compaction and maintain consistent yields over time. 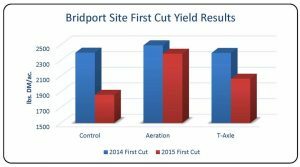 Three field sites were selected in Bridport and Addison to impose repeated aeration tillage treatments using a Gen-Till aerator, a single-axle Aerway, or a tandem-axle (T-axel) Aerway aerator tillage implement on hay fields. Data was collected in 2014, 2015 and for the first cut of 2016 at the Addison site; and 2014 and for the first cut of 2015 at the Bridport site. 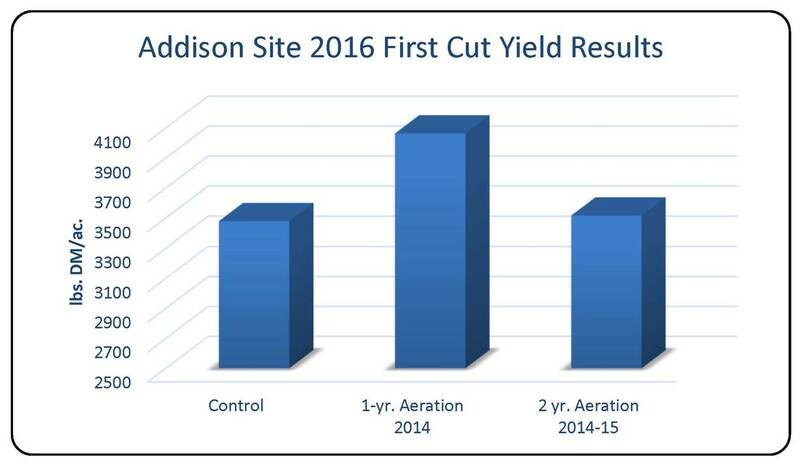 Treatments at the Addison site were no aeration, aerated one year (2014), and aerated two years (2014 and 2015). The 2015 growing season was unusually wet in June with over 8.5” of rain. The aeration appears to have positively affected yield in 2016 for aeration in 2014, but negatively affected yield in 2016 for aeration in both 2014 and 2015. The second year of aeration soil was saturated during the growing season. Aeration treatments had greater yield than the control in 2014 for all three cuts, but similar or lesser yield than the control in 2015 for both cuts. 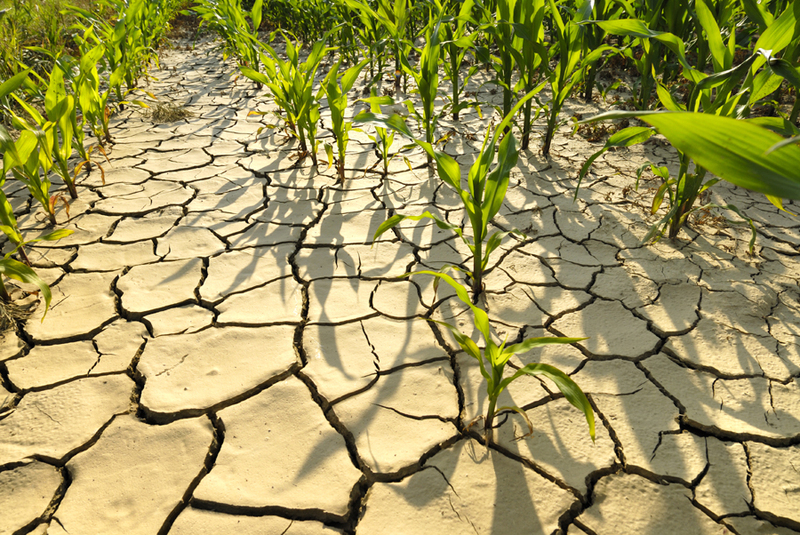 It is well known that clay soil is susceptible to compaction under saturated conditions, and these results are likely reflecting those conditions. Soil samples were collected from each treatment block in November 2015 and sent to Cornell Soil Health Test lab for analysis. Soil compaction in the treatment areas was measured using a manual soil penetrometer to record the maximum pressure (psi) required to penetrate the soil from 0 to 6 inch depth and 6 to 18 inch depth as part of the Cornell Soil Health Test field procedures. 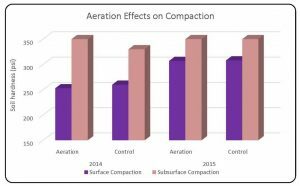 Surprisingly, average surface compaction measurements were not significantly different as a result of the aeration treatments. Subsurface compaction showed a slight increase under aeration, though aeration tillage is not expected to change soil compaction at that depth. The farmer at the Addison site, Doug Gould, used the FM-750 GPS steering guidance unit that we provided to track aeration tillage activities in the field. 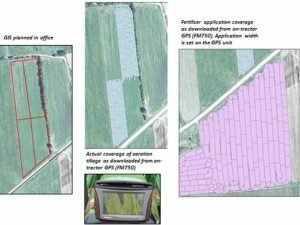 As a result, he has purchased his own GPS guidance system to use while aerating or during fertilizer application to improve field efficiency of machinery operations. The soil conditions during the time of aeration will likely have an impact on compaction and yield. If the soil is wet at the time of treatment, aeration may be less effective and even counter productive. If the soil is dry at the time of aeration, aeration may benefit compaction and yield. Table 1. 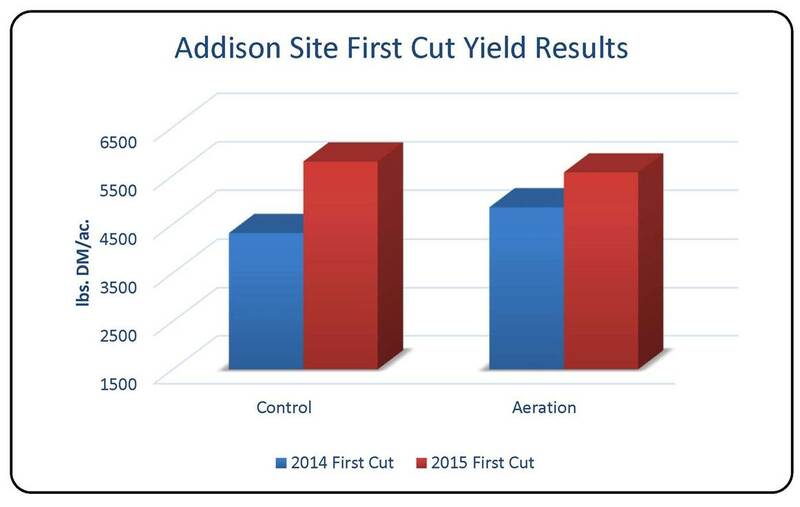 Effects of aeration in 2014 and 2015 on 2016 first cut hay yields. Table 2. 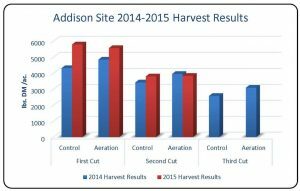 Average hay yield results comparing control and aeration in 2014 and 2015 for all hay cuts. 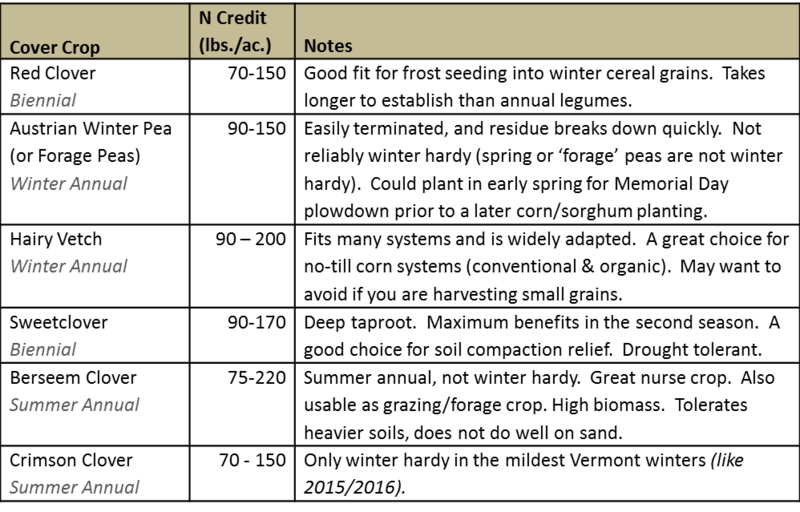 Table 3. 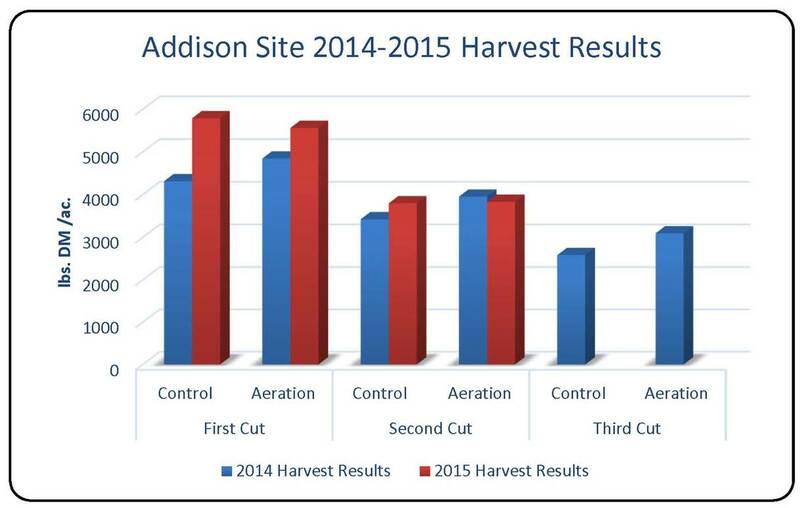 First cut hay yield comparing control and aeration at Addison site only for both 2014 and 2015. Table 4. First cut hay yield comparing control and aeration at Bridport site only for both 2014 and 2015. Table 5. Comparison of aeration and control on average soil compaction in 2014 and 2015 at both sites. 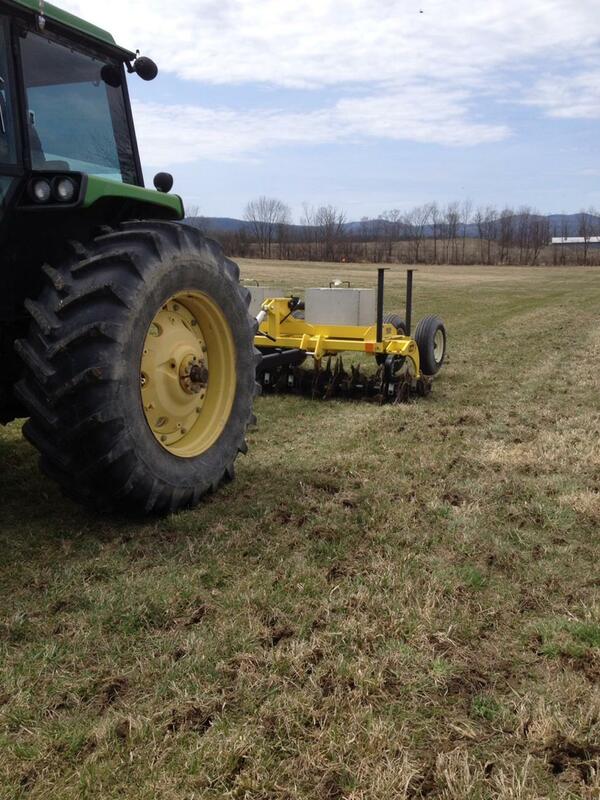 Vermont farmers are on target to plant over 20,000 acres of cover crops this year. The majority of these acres will be planted to winter rye, but there is still time (even now) to get a little more from your cover crop. Legumes are unique because of their ability to fix nitrogen, utilize that nitrogen themselves reducing fertilizer requirements, and contribute it back to the soil for use by the following crop. Agricultural legumes are plants that are in the family Fabaceae. 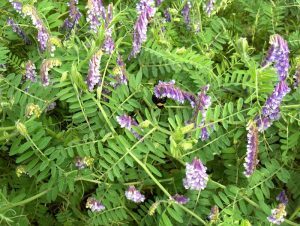 Most farmers are familiar with the list of legumes that comprise their forage legume species like alfalfa, clover, and trefoil, or those that are grown for grain like soybeans, peas, lentils and even peanuts. And don’t forget the vegetable legume crops like green beans and snap peas. Legumes also have a much lower carbon to nitrogen ratio (C:N) than cereal grains, so they decompose quicker making that nitrogen more available to the subsequent crop. 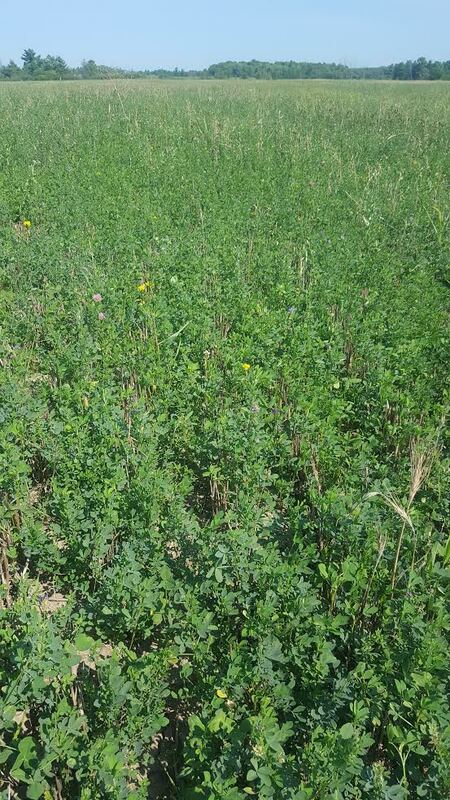 If you have ever plowed down (or killed) a nice stand of alfalfa and then planted corn, then you know just how beneficial a legume in your crop rotation can be. 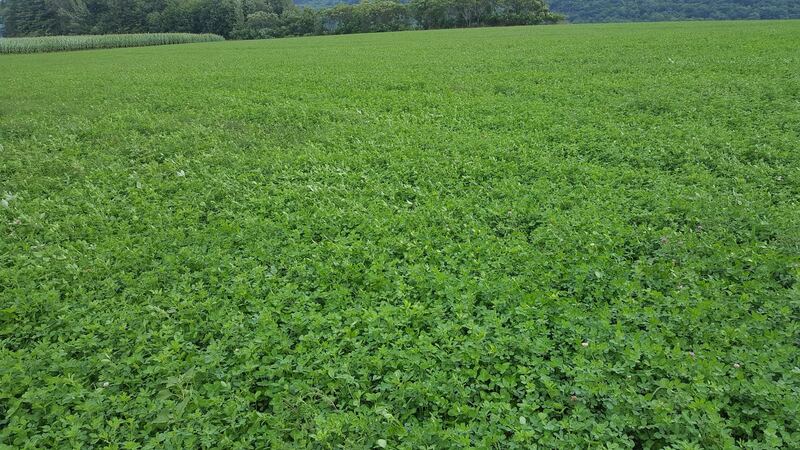 Legumes can provide over 100 pounds of nitrogen credit per acre, which is why they are often called ‘green manures’. The legumes themselves are not responsible for nitrogen fixation, however. This happens as a result of a symbiotic relationship between the nitrogen-fixing bacteria that invade the plant root and store nitrogen in root nodules. The plant provides the bacteria with nutrients and energy, and the bacteria provide the plant with a usable form of nitrogen. These bacteria, called Rhizobia, are able to take nitrogen gas from the atmosphere (N2) and convert it to ammonia (NH3), which is then converted to ammonium (NH4+) and nitrate (NO3–) which are the forms of nitrogen usable by plants. 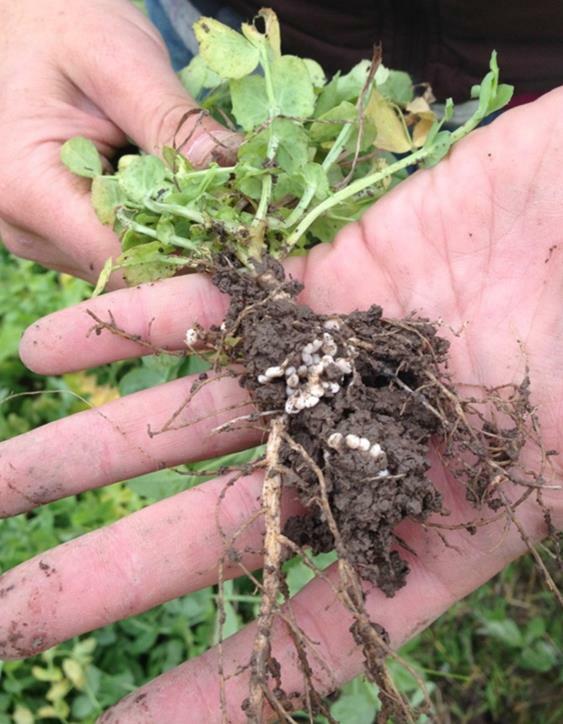 In order for good root nodulation and maximum nitrogen production, it is important to inoculate your legumes with the appropriate species of Rhizobia bacteria at planting. Some seed is available pre-inoculated, but many times you will need to apply the inoculant yourself. Whoever you get your seed from should have inoculant available as well. Beware, however, inoculants have a short shelf-life and are also species specific. Using clover inoculant on peas or vetch will not be successful. Graph 1. PAN from cover crop related to date of cover crop termination. Originally from D. Sullivan, Oregon State Univ. See reference below. The ability of your legume cover crop to supply nitrogen to your subsequent crop depends on how much biomass and when you terminate the cover crop. This plant available nitrogen (PAN) becomes available roughly 4-6 weeks after cover crop termination. 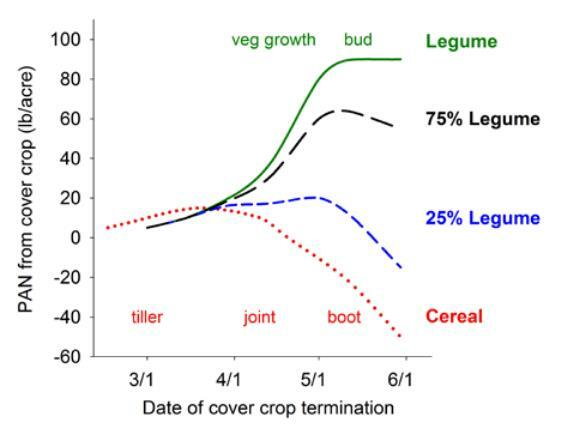 Oftentimes, a cereal grain terminated at or beyond the boot stage can actually immobilize nitrogen and create a PAN deficit, making it necessary to increase fertilizer/manure nitrogen applications. This is because microbes are tying up nitrogen temporarily as they break down the carbon rich material. Conversely, a cover crop terminated too early will provide only minimal PAN. 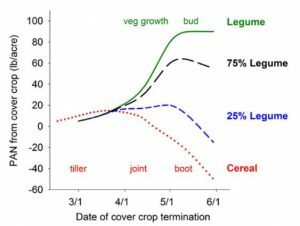 Below is a simple explanation of the differences between cereal grain and legume cover crops and the implications of when you terminate them. Table 1. From information in the publication by D. Sullivan referenced below. Legume cover crops will need to be planted earlier than cereal grains to survive winter and maximize N production. 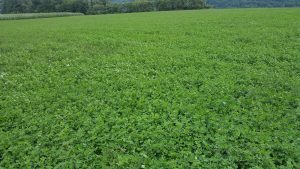 For clovers, you’ll want them established by August 15th in Vermont, so this limits them to being interseeded or planted after a cereal grain harvest. The winter annual legumes can be planted as late as September 1st through 15th, which means you can still plant them after a timely corn harvest. 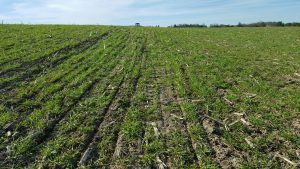 If you are planting legume cover crops only to replace nitrogen, the economics may or may not pencil out. Usually in organic systems, this is a preferred practice. However, when commercial nitrogen fertilizer is $45 for 100 pounds of nitrogen and a legume cover crop could cost you $70 per acre for that same 100 pounds the nitrogen benefit may not be financially rewarding. Certified organic fertilizer, however, could run you $150 per acre, making the cover crop a wise investment. However, a legume cover crop is more than just nitrogen, and these additional benefits are harder to quantify. According to USDA this includes “yield improvements beyond those attributable to nitrogen alone. These may be due to mulching effects, soil structure improvements leading to better moisture retention and crop root development, soil biological activity and/or enhanced insect populations below and just above the soil surface.” (Clark, SARE). They are also great soil conditioners, and can provide early weed suppression. There are many legume cover crops, but the table below gives a list of the most common ones planted in the northeast. Sullivan, D. and N. Andrews. 2012. 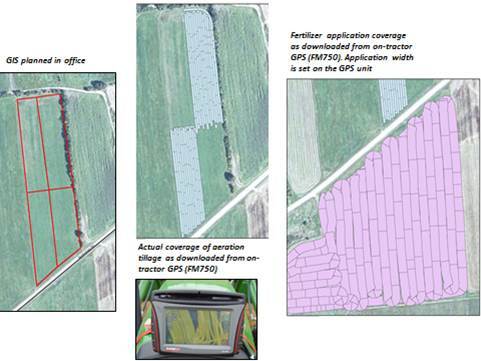 Estimating Plant-Available Nitrogen Release from Cover Crops. Oregon State University Extension Service. Clark, A. 2007. 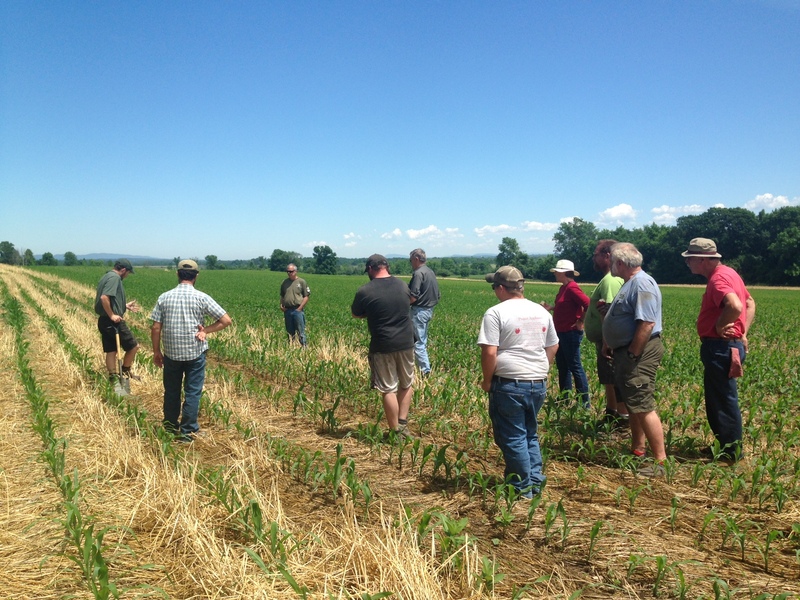 Managing Cover Crops Profitably. College Park, MD: SARE. Flynn, R. and J. Idowu. 2015. Nitrogen Fixation by Legumes. New Mexico State Unviersity Extension Guide A-129. 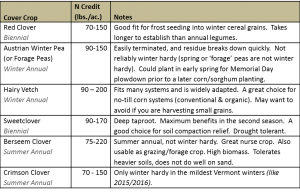 Carbon to Nitrogen Ratios in Cropping Systems. 2011. 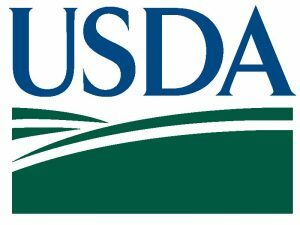 USDA Natural Resources Conservation Service.